Please enter in the miles you would like on your sign. If you don't know them , or would like us to calculate them for you, just put the address you would like us to use. The perfect gift for the Baylor Bears Fan. 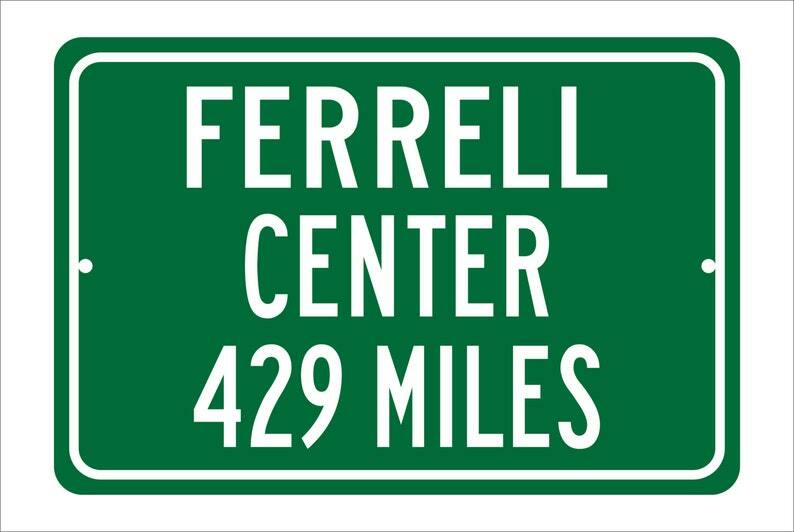 What better way to show school pride and spirit than to have your very own highway sign that tells the distance to your favorite teams stadium or arena! Each sign has been made to capture the look and feel of a real highway sign by reproducing the colors and the fonts that are used by the DOT in it's official signs. Our signs are made from Heavy Gauge Aluminum, have an amazing high gloss finish and come complete with 1/4" mounting holes (except 5 x 7 size) that make it easy to mount just about anywhere. They are even light enough to use something like command strips on. Please note that no mounting hardware comes with the sign. The size of this sign is 8" x 12" and fits nicely on any door, wall, or sign post. It is lightweight, yet very sturdy. These beautiful signs are printed using sublimation technology, which means the graphics are permanently baked into the item and it will not crack, wear or fade. And just about any other place you can think of! Our signs are 100% Satisfaction Guaranteed or we will refund your money! Our highway signs are very high quality, we do not use cheap vinyl decals, we use the best printing processes and equipment available. Our signs will not crack, wear, peel or fade..
We use Google Earth to determine the distance from your location to the destination. 1) We can use the "ship to" address that you want the item to go to. This is the default method unless you tell us otherwise. 2) You can send us the address you want us to use for the calculation when you place the order in the "Notes to Seller" section. 3) You can "convo" us after you place the order an let us know where to calculate the distance from. 4) Calculate the distance yourself and just send us the information! NOTE: If you do not tell us otherwise, we will use the "ship to" address of your order. Due to variations in computer settings, please be aware that the final product colors may vary from what you seen on your screen. This applies to all products that are printed on the principle of sublimation. All items regularly ship USPS First Class Mail. You can however select expedited USPS Priority Mail shipping at checkout. Please remember that priority shipping only expedites the shipping, not the processing time it takes for the item to be made! Please contact us if you need to expedite the processing time (additional fees may apply). These signs are not officially licensed or endorsed products. We are not affiliated with any school, organization, or company that appears on any of our products. 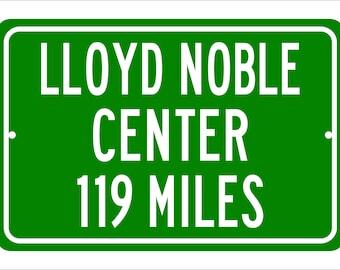 DJN Design Studio produces its distance and highway signs for informational and entertainment purposes only. Love it and want to buy later? Click on the heart to your right that says "Add item to favorites." Want it now? Click the green "Add to cart" button. Special request or you have a question for me? Click the small blue "Contact" link under my name on the right. It was exactly as described and arrived earlier than expected! Very happy with the item and with the seller. Just as the picture. Looks Great. I love it. Leaving us feedback? PLEASE remember to contact us first if you have an issue and give us an opportunity to make it right. We consider ourselves pretty reasonable to work with...so please, be nice.